Tile and grout are a great low maintenance choice for your flooring, but even tile and grout need to be professionally cleaned periodically to restore their original luster. KIWI Services is the industry leading tile and grout cleaning company. We have left thousands of customers happy with our professional tile and grout cleaning, making us the most trusted source for great tile cleanings. With 30 years of experience, it’s no wonder we remain the best professional tile and grout cleaning company. With 30 years of experience and a commitment to ongoing training, KIWI tile and grout cleaning services provides the experience and expertise you can rely upon with a name you can trust. Our professional service technicians are fully licensed, bonded and insured to provide the security you demand when having work performed in your home or business. Unique cleansers to eliminate dirt and degrease heavily soiled areas. Buffers and bonnets to loosen and lift particles while restoring the shine and luster of the tile. Specialized tile and grout cleaning machines designed explicitly for tile. Penetrating cleaning and abrasion methods to eliminate deeply set stains. KIWI is an independently owned and operated tile and carpet cleaning company that professionally cleans tile floor, stone tile, natural tile, porous material, grout lines with our grout cleaning process, and we also offer hardwood floor cleaning for your hardwood floors, and sealing services that allow you to get your floors sealed. KIWI also offers floor maintenance so that your tiles can stay polished longer. KIWI will have your kitchen tile looking like new after we’re done deep cleaning. When KIWI comes to professionally clean your tile and grout, we send out the best technicians that do more than any dish soap, hydrogen peroxide, or baking soda could do. There is no need for you to do the work yourself when KIWI comes. Our technicians are expertly trained and highly skilled to get your floors looking great again. We also offer air duct cleaning to make sure your air quality is in top shape and we also offer commercial cleaning services including carpet cleaning. Hiring professional floor cleaners like KIWI ensures your floors will be cleaned to perfection. Our cleaning products are the best in tile floor cleaner and grout cleaner solutions. Our cleaning solution is able to clean grout, stone tile, and much more. We do more than just sweep and vacuum to remove dirt and debris, we do a detailed quality cleaning. Removing dirt is extremely important in getting and keeping your floors looking great. Residential ceramic tile floors in the kitchen, bathroom or foyer. Tile walkways, foyers or entrance-ways. Newly installed tile including haze removal. Rehabilitations or remodeling projects involving old tile and antiquated grout. Tile mosaic floors or specialized tile patterns. Retail, commercial or small business tile flooring needs. Fireplace tile and surrounds including difficult to clean soot and stains. Mold and mildew problems associated with humidity and grout. Much more! If it related to tile and grout cleaning then chances are we can handle it. Whatever your tile and grout cleaning needs may be, one simple call to KIWI really can do it all. From stain removal and deep cleaning of old tiles and mosaics, to dealing with mold and mildew spores associated with high humid areas; KIWI can solve your most tiresome tile tribulations at a fraction of the time and hassle of doing it yourself. Properly cleaned and maintained tile can last a lifetime without need for costly renovations. Inside or outside, take time to have tile professional cleaned and maintained on a regular basis to keep your floors and other tile projects looking like new. 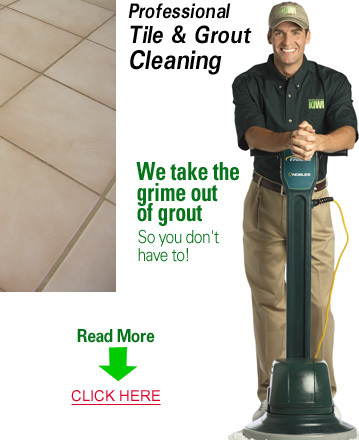 Remember, KIWI takes the grime out of grout so you don’t have to!